My alarm goes off at 6:30 a.m. after a night of anxiety-filled sleep — anxiety about the race, life, being back in Berlin for the first time since I left last year. In the middle of the night, still unable to sleep, I’d decided to skip the race and stay home instead. There’s no way I was going to be able to run well with a niggling knee injury and no sleep. But a few hours later, the alarm ringing in my ears, I resist the urge to hit snooze and crawl out from under the duvet. I make porridge in Hilarey’s kitchen, adding a banana, some seeds, then wolf it down and leave the house. It’s a chilly morning and I regret not wearing trousers, so I nip into a bäckerei, hoping a coffee will warm me up. There are a couple of other runners on the station platform, easily distinguished by their race bags and bleary-eyed nervous energy. The train gradually fills with more of us as we travel almost the entire length of the U2 line from Vinetastraße to Olympia-Stadion — a rainbow of lycra interspersed with a handful of bemused commuters. I wander around the outside of the stadium looking for Marco as the cold morning wind whips around me, nowhere to hide except the toilets, overflowing with runners trying to placate their unsettled stomachs before the race. I used to take my laptop and work in Marco’s cafe when I lived in Berlin and he’d invited me to join him for the race when I said I was going to be in town. I eventually find him surrounded by fellow Nike Run Club members decked out in matching shirts, performing warm-up exercises en masse. I’m the odd one out in my six-year-old New Balance shirt, the logo all but peeled off, and blue Brooks trainers with shiny, garish trims — chosen for their fit, not aesthetic. The Nike crew is brimming with energy. I want to be in bed. Marco says he’s aiming to run the half marathon in 1:25, five minutes faster than I’d planned. Seeing as the situation already feels so hopeless, I say I’ll join him and see how it goes. He sets off fast, faster than the pace needed for a 1:25 time, but I match him step for step and settle in. The early start and lack of sleep leaves me feeling disconnected to my body and the start of the race passes by in a haze, like my legs haven’t quite understood what’s happening. The wind eases up, the sun breaks through, and the first 10k towards Tiergarten feels okay. The few people that have come to watch the race, or stumbled upon it when leaving the house that morning, are mute. The race stewards do their best to offer encouragement but the vibe is as beige as a long Berlin winter. By halfway, I’m spent. I can tell Marco’s struggling; whereas before he’d always been a step or two in front of me, now I’m driving the pace. I desperately want to slack off but I’m also intrigued to see how long I can keep this up for, how long before I slow down and watch the 1:25 goal disappear. We begin to retrace our steps from Tiergarten to the Olympic Stadium on a different, but almost identical, road, and I realise I’m almost alone. Marco drops back from my side and after giving him a thumbs up to check he’s okay, I push on, using a runner fifty metres ahead as my pacer. At 15k, the temperature drops, the wind picks up, and icy rain starts coming down. I’m now completely alone, save for a few elite African runners passing me as their 25k course merges with ours. It’s desolate, silent, and my body is screaming at me to quit. Instead, I lift my head up, push my chest out, and pump my arms like pistons in the hope that I’ll survive the long uphill climb ahead, directly into the rain and wind, without dropping my pace. Eventually, the stadium’s in sight. I dig in as hard as I can and keep my eyes peeled for Hilarey, who’d said she’d come to the stadium to cheer me on. I see her as I round the corner just before going into the stadium, manage to shout “Oh, God!” and enter the tunnel to the deafening sound of twenty drummers playing solely for me, or so it seems. Then, light at the end of the tunnel — literally, symbolically — meaning only 400 metres of track left to run. There’s something comedic about being in such an opulent structure, only for it to be almost empty. I sprint to the finish and check my watch. 1:25:52, 18th out of 862 people, a new personal best. Six days later, I’m back in my hometown of Gothenburg. Unusually, today’s race doesn’t involve an obscenely early start; Göteborgsvarvet, the world’s largest half marathon, doesn’t kick off until the afternoon. Even then, the 64,000 runners are released in batches in a fruitless attempt to stop the course from becoming congested. My friend Phil has flown over for the weekend to run with me and after warming up and realising there’s still 45 minutes to wait for the start time of our allotted group, we hop the fence into an earlier time slot and prepare to run. Thanks to the sheer volume of people, the awkward shuffle-run towards the start line continues long after I’ve crossed it. After a few minutes of throttled jogging I start cutting through runners, narrowly avoiding spectators on the grass, eventually managing to carve out the tiniest amount of breathing room. I keep hoping to round a corner and be greeted with open road but it never happens. It’s not just the course that’s hampering my progress. Despite resting for the six days since Berlin’s half marathon, with the exception of a six-mile shakeout run with Phil two days earlier, my body is spent. 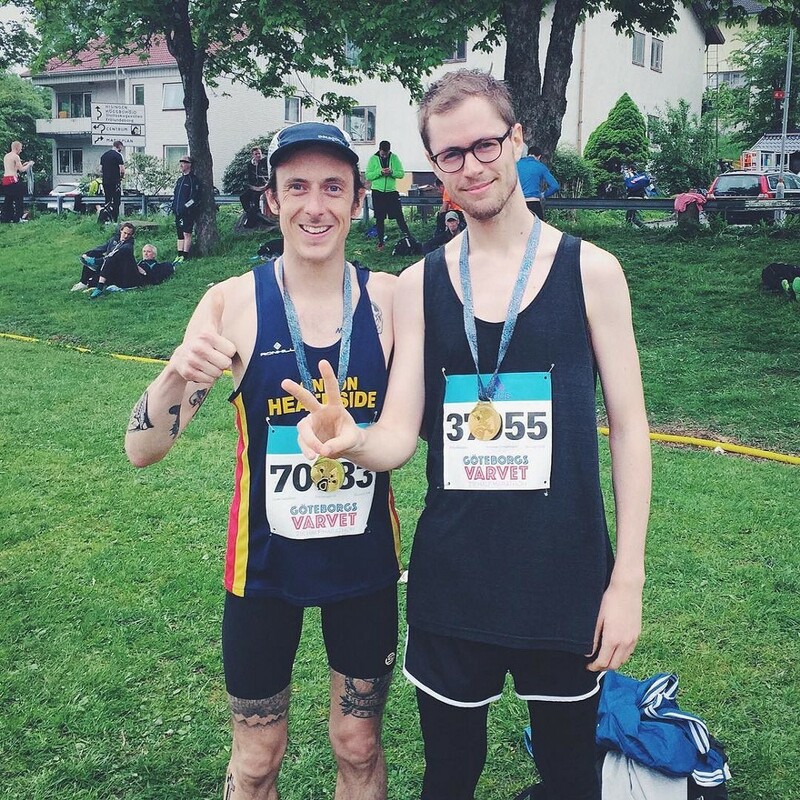 I was attempting to match my 1:25 in Berlin, hoping that the festival atmosphere and home turf would make up for my fatigue, but every time I check my watch, my pace is way off. Everything feels heavy. I decide to cling on for 1:30 instead. The course takes me past places I know and the crowd is everything that it wasn’t in Berlin, but I’m so tired. With my body failing to do what I want it to, the race feels joyless. The last few miles stretch on forever as I tramp through the discarded paper cups of all the runners that have gone before me, the smell of papier-mâché in the air. While only one runner has overtaken me in the first ten miles of the race, as I pass through the city centre in the final miles and the course gets busier, I start to lose my grip. Finally, we cross the bridge to Slottskogen. I know the park intimately from training there for a month when I first moved to Sweden in February. Back then it was covered in ice and snow, every run a battle to keep my hands from going numb as I circled the park, nodding at the other runners who’d left the house at 7am and braved the cold, putting in the miles in hopes of marathon success in the spring. Now the park’s covered with spectators eating picnics and scanning the never-ending stream of runners for their friends. I cling on for the final kilometre, crossing the line with 1:35:54, ten minutes slower than Berlin. An hour or so later, Phil and I finally manage to catch a tram home. I’m feeling pretty fragile and buy a can of coke, hoping it’ll perk me up. Not long after getting on the tram, I start getting waves of searing pain in my gut that make me feel like I’m going to vomit or crap myself, maybe both. I take my jacket off and hold it in my lap for something to catch the puke. The pain gets worse and I become feverish, sweat pouring from my face. I turn pale and the guy opposite us on the tram, full of banter when we got on, now looks terrified. I can barely speak but manage to mumble to Phil that we need to get off. We exit at Korsvägen and I collapse against the side of the tram stop, lying down on the floor. People exiting the tram walk around me looking concerned, an onlooker offers some coke. Phil declines on my behalf. After half an hour of feeling like death, I think I might be able to board the tram again. We travel the last few stops home and get off at Ejdergatan, where I sit down again. Using Phil as a crutch, I finally make it home and fall face down on my bed, still in my race clothes. I wake up the next day with the familiar post-race aches in my legs. Limping to the bathroom, past the new medal hanging on the wall, I find myself thinking about the Stockholm marathon in two weeks, yesterday’s pain a distant memory. I don’t know why I keep putting myself through it. All I know is that there’s no way I won’t be there. I’ll see you at the start line.